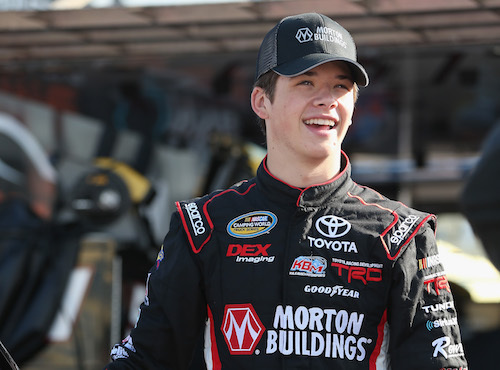 NASCAR Gander Outdoors Truck Series regular Harrison Burton has signed on to drive the No. 18 Joe Gibbs Racing Toyota in eighth NASCAR Xfinity Series races throughout the remainder of the 2019 season, beginning with Saturday’s race at Bristol (Tenn.) Motor Speedway. The Bristol race will be Burton’s Xfinity Series debut. Other races in which he’s expected to drive the No. 18 car include Iowa Speedway in Newton on on June 16, New Hampshire Motor Speedway in Loudon on July 20, Richmond (Va.) Raceway on Sept. 20, Charlotte (N.C.) Motor Speedway on Sept. 28, Dover (Del.) International Speedway on Oct. 5, Kansas Speedway near Kansas City on Oct. 19 and Texas Motor Speedway near Fort Worth on Nov. 2. Burton has driven for Kyle Busch Motorsports in the Truck Series since 2016, racing part-time in the series for three seasons before going full-time in 2019, his first full season since turning 18, NASCAR’s minimum age limit for racing at all tracks in the series. In 20-career Truck Series starts, he has five top-fives and nine top-10 finishes. Kyle Busch has driven the No. 18 in the four most recent Xfinity Series races, winning three times. As a Monster Energy NASCAR Cup Series regular, he is limited in the quantity of Xfinity Series races he runs and is prohibited from the next four, as they are a part of the Xfinity Dash 4 Cash program. Jeffrey Earnhardt drove the car in the first two races of 2019, posting a best finish of sixth at Atlanta Motor Speedway.